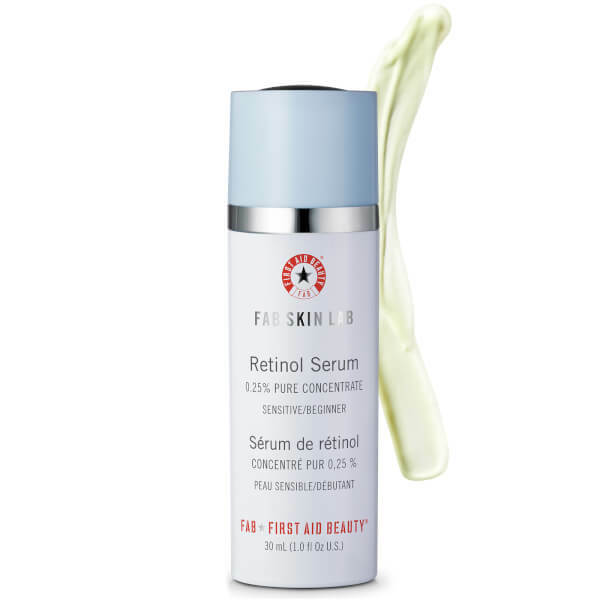 Restore a youthful appearance to the visage with the First Aid Beauty Skin Lab Retinol Serum 0.25% Pure Concentrate; a gentle yet effective formula developed for those with sensitive skin, or those first introducing their skin to retinol treatments. 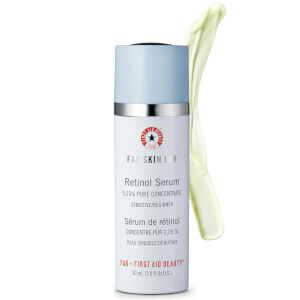 Boasting a 0.25% concentration of pure Retinol, alongside First Aid Beauty’s proprietary Skin Saver Complex, the formula is able to deliver the benefits of retinol, without causing irritation. The blend of Retinol and advanced peptides reduces the appearance of fine lines and wrinkles, to restore a smooth appearance to skin’s texture. The serum is enriched with Hyaluronic Acid, Vitamin C and Aloe, which work in synergy to offer a soothing and comforting feel, whilst supporting skin’s health and alleviating irritation associated with retinol-based products. After use, skin appears refreshed, rejuvenated and enviably youthful. Warning: It is normal for some redness, flaking or dryness to occur when first using any retinol-based product. If this continues for more than two weeks, we recommend applying FAB Skin Lab Retinol Serum over your favorite PM moisturizer.